As soon as the temperatures fall and the first snow has settled, the hiking paths and various pass roads are transformed into snowy-white trails that are perfect for tobogganing. Besides shorter descents and gentle routes offering leisurely rides, there are also official toboggan runs throughout the region that can really get the adrenaline pumping. High speeds and hairpin bends: the toboggan run promises unforgettable thrills. Two charming trails offering relaxed toboggan rides. ...and off on a ride through the enchanting snow-laden forest. Countless cars and motorcycles pass this way in summer, but in winter, toboggans have right of way. Toboganning fun high above Madulain. 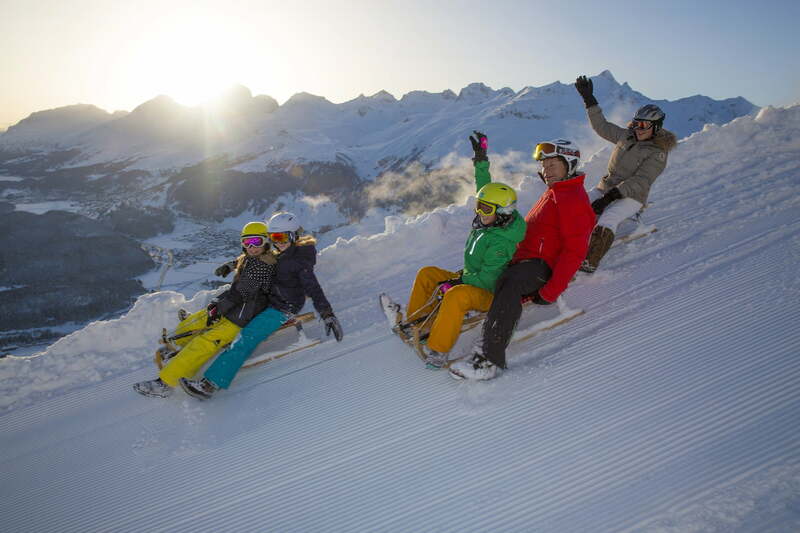 The family ski resort of Zuoz is proud to present its toboggan run. Snowtubing is great fun for people of all ages. Fun on runners: our toboggan trails guarantee high thrills.